A letter sent by celebrated frontiersman Hugh Glass, who is the subject of the current hit movie “The Revenant,” is currently on display in the research room of the South Dakota State Historical Society-Archives at the Cultural Heritage Center in Pierre. The display features a one-page letter sent by Glass to the parents of John S. Gardner, killed on June 2, 1823. The letter was written near Gen. Ashley’s Camp near the mouth of the Cheyenne River. Since Glass was reportedly illiterate, he undoubtedly had an acquaintance write the letter for him. My painfull duty it is to tell you of the deth of yr son wh befell at the hands of the Indians 2d June in the early morning. He died a little while after he was shot and asked me to inform you of his sad fate. We traded with them as friends but after a great storm of rain and thunder they came at us before light and many were hurt. I myself was shot in the leg. Master Ashley is bound to stay in these parts till the traitors are rightly punished. Matthew T. Reitzel, manuscript/photo archivist for the State Historical Society-Archives, said the letter was donated to the society by one of Gardner’s descendants around 1902. There is no charge to see the letter. Archives hours are 9 a.m.-4:30 p.m. CST Monday through Friday and the first Saturday of each month. Originally from Pennsylvania, Glass was known as a rugged frontiersman, expert hunter and trapper, fur trader and adventurer along the Upper Missouri River watershed. Most writings emphasize that Glass was “an old man” by 1823. That spring he joined Gen. William Ashley’s Missouri River Expedition and was later mauled by a grizzly bear and left for dead by his companions near the fork of the Grand River in present-day Perkins County, near Lemmon. He ventured some 200 miles over six weeks to Fort Kiowa, located north of present-day Chamberlain. Glass would later search for the two men who abandoned him, eventually forgiving them of their deed. Glass returned to his life of trapping and trading. In the winter of 1833 he was killed by a band of Arikara Indians on the Yellowstone River. A number of accounts were written of Glass’ life, most notably the poem, "The Song of Hugh Glass,” by John G. Neihardt and the book “Lord Grizzly” by Fredrick Manfred. This spring, a new biography by historian James D. McLaird will be released as a part of the South Dakota Historical Society Press’ South Dakota Biography Series. “Hugh Glass: Grizzly Survivor,” will be available for $14.95, and details the legend behind the infamous frontiersman. 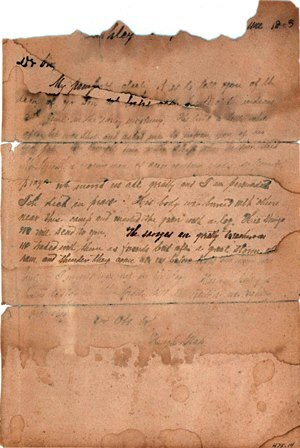 Editor’s Note: This letter, sent by Hugh Glass to the family of John Gardner in June of 1823 is on display in the research room of the South Dakota State Historical Society-Archives at the Cultural Heritage Center in Pierre.